Dear Utah: Seriously, Can You Learn How to Close the Door? 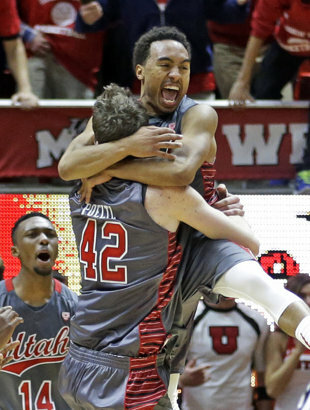 Against Wichita State, it was sort of heartwarming; Utah getting that close-game monkey off their back (they had been 3-9 in games decided by two possesions or less since Delon Wright put on a Utah uniform at the start of last season). The fact that they had to blow a comfortable lead in the waning moments to make the game close to begin with was forgivable givne the final result. 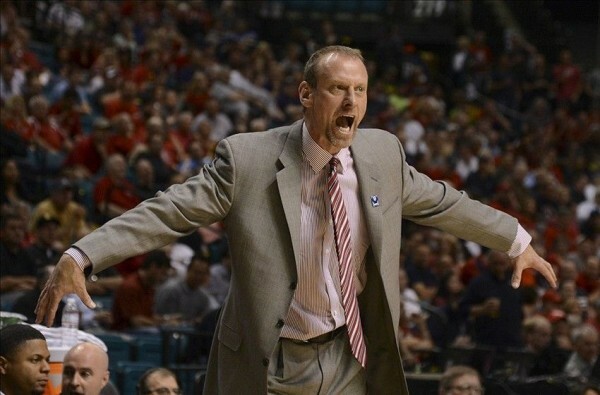 Against BYU on Wednesday night, heartwarming turned into heartburn. Really, by the time this game reached the first TV timeout early in the first half, there was no doubt as to who was the better team, who had more talent. Sure, BYU’s Tyler Haws is an elite scorer capable of keeping his team in a lot of games it has no business being in. And Kyle Collinsworth? Goodness. I have neither the time nor the imminent desire to list all the things I love about that dude’s game. But beyond that, the rest of that BYU roster is more or less indistinguishable from any other random team that will likely be on the periphery of NCAA Tournament discussion in a few months. They’ve got some decent parts (Anson Winder is nice, Chase Fischer is flammable, some passable bigs), but on a whole, there ain’t a whole lot to write home about beyond those two. Meanwhile, Utah’s got Wright and Jakob Poeltl as stars (even if Poeltl played very much like the freshman he is in his first Holy War – six points, seven boards, two blocks doesn’t cut it when you’re in NBA Lottery conversations), while every other guy that gets on the floor in a Utah uniform brings some combination of size, skill, toughness and/or raw athleticism. Just look at the first 15 minutes or so of each half on Tuesday night. In the first half, 14 minutes into the game, the Utes led 28-18 and were cruising, even if BYU had shaved a few points off of what had been a 13-point lead at it’s peak. But, by the time the first-half buzzer had sounded, the Utes had managed just two more free throws (with three seconds left in the half), while the Cougars had reeled off 13 in a row at one point to take a 31-30 lead into the locker room. No worries though, right? After a sluggish start to the second half that turned that 31-30 deficit into a 38-34 deficit, the Utes again began taking apart the Cougs bit-by-bit, possession-by-possession until a four-point shortage turned into a nine-point windfall, again with about five minutes remaining in the game. Utah was throwing down around-the-back, breakaway dunks to cap off suffocating defensive possessions (well, honestly, full credit for that one goes to Wright and Wright alone) and looked for all the world to be easily shutting off the water for one of America’s most explosive offensive teams. And then – Haws layup off Collinsworth dime, then Anson Winder sandwiches a pair of threes around a layup of his own, then Collinsworth scores on a putback and – all of a sudden, with a minute left it is a one-possession game again, the Utes look like wide-eyed freshmen incapable of closing a half, let alone a game, out. Long story made bearable, the Utes close the game out in anything but decisive fashion, earning a four-point win but leaving their fans to wonder for a couple days more: was that Wichita State game a fluke? It doesn’t take a great leap of the imagination to see Evan Wessel knocking in that putback late and sending the Utes back to the locker room losers in that game. Last night, a call or two, an unkind bounce on the rim, maybe BYU senior big Nate Austin doesn’t get hurt early in the first half and a game where one team was clearly the better squad goes home the loser anyway. Concerning. But really, let’s put this in perspective. Utah/BYU, one of the nation’s great rivalries. The Cougars have that Haws/Collinsworth. They’re playing at home in the Marriott Center, which is one of the best home-court environments in the land. The Utes without arguably their second-best offensive player in Jordan Loveridge. Brandon Taylor can’t hit the broad side of the barn from the field and even, surprisingly for a guy who had made 18-of-19 from the line prior to tonight, misses two from the charity stripe down the stretch. Nobody beyond Wright scores in double figures for the visitors. And still they come away with a win. There is something to be said for winning ugly. And, the whole two straight wins in games decided by two-possessions or less is a good trend. But with Kansas in Kansas City looming this weekend, let’s all just hold off on the fanfare for the Utes just a smidgen longer. Good work coming out with the short-handed road win in a rivalry game in which you didn’t play all that great offensively. But seriously, this whole inability to close the deal thing you’ve got going on is no longer cute. This entry was posted on Thursday, December 11th, 2014 at 3:31 pm by Andrew Murawa	and is filed under microsites, pac 12. Tagged: anson winder, brandon taylor, byu, delon wright, jakob poeltl, jordan loveridge, kyle collinsworth, nate austin, tyler haws, utah. You can follow any responses to this entry through the RSS 2.0 feed. You can leave a response, or trackback from your own site.